Service Caster manufactures casters for high temperature locations. Applications for this wheel includes bakery oven rack casters, bakery cart casters, powder coating room rack wheels and casters. Also, suitable for bread racks, carts, and dollies in other high heat environments such as an autoclave. Phenolic caster wheels perform optimally in dry locations. Exposure to heat up to 475° F for 30 continuous minutes of operation is the recommended maximum temperature and time. Glass Filled Nylon Wheels for high temperatures are able to withstand wet environments. 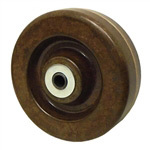 4" x 1-1/2" High Temperature Phenolic Wheel - 600 Lbs Cap. 4" x 2" High Temperature Phenolic Wheel - 800 Lbs Cap. 5" x 2" High Temperature Phenolic Wheel - 1,000 Lbs Cap. 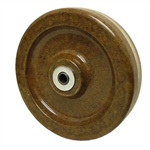 6" x 2" High Temperature Phenolic Wheel - 1,200 Lbs Cap. 8" x 2" High Temperature Phenolic Wheel - 1,400 Lbs Cap.